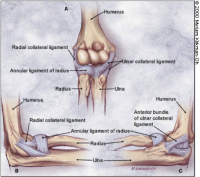 The purpose of the varus stress test of the elbow is to assess the integrity of lateral collateral ligament. With the patient is standing, the therapist places the patient's elbow in slight flexion while palpating the humeroulnar joint line. The therapist then applies a varus force to the elbow. This test is considered positive if the patient experiences pain or excessive laxity is noted and compared to the contralateral side. The test can be repeated in varying degrees of elbow flexion, but generally it is positioned between 5 and 30 degrees.